A few weeks ago on a Saturday afternoon, I was visiting an old friend who lives in Cobourg, Ontario. He chose to take me to a popular local restaurant called The Buttermilk Café for lunch. When we were parking the car, he said he was recommending this establishment because the food was really tasty and the restaurant is known for providing excellent customer service. In particular, he told us about a time when he had a problem with his meal and how the restaurant bent over backwards to make it right and apologize for the inconvenience. To this day, he has not forgotten what they did for him, so as an aside, it just goes to show how service recovery can lead to loyal and long-lasting customers. Within a couple of minutes of being seated, the server took our order and quickly brought us our drinks. Before we knew it, our main courses arrived and it was at that time when I realized I made a mistake on my order. I ordered an omelette thinking that it included red peppers, when in fact, it came with green peppers….which I can’t eat. Just as we were beginning lunch , the server came back to check on our table and see how our meals were (table checks are another sign of a good restaurant!) and she noticed I wasn’t eating my food. She asked me if everything was all right and despite me insisting that the mistake was mine, she immediately scooped up the plate and said she would have it remade without green peppers. I told her it was unnecessary, since it was my own fault, but she insisted on remaking the omelette as “The Buttermilk Café wants all of their customers to be happy and satisfied”. At this moment, I realized The Buttermilk Café clearly cares about their customers. Where most servers would have just been sympathetic and said sorry or something along those lines, this establishment wasn’t satisfied until the customer was. The new omelette was just as terrific as the service, arriving hot and fresh. 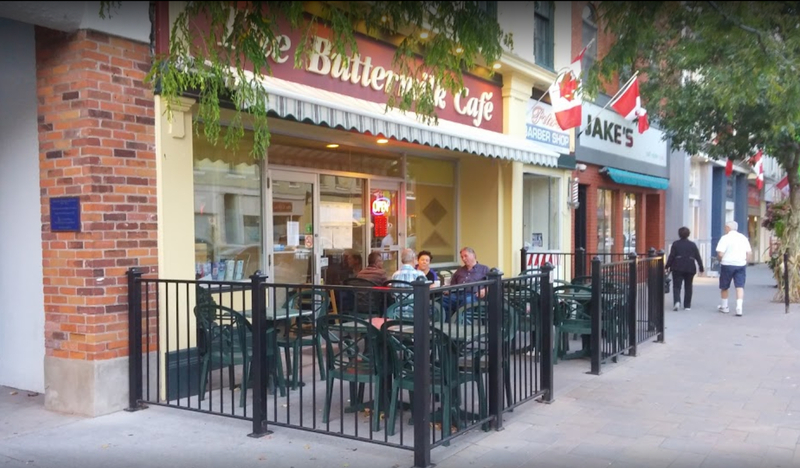 Between the great home cooked food and a clear commitment to customer service and satisfaction, if you ever get out to Cobourg, you won’t go wrong dining at the Buttermilk Café.